Want that 70″ LCD television in your living room to be an Android device? This little guy can make it happen. 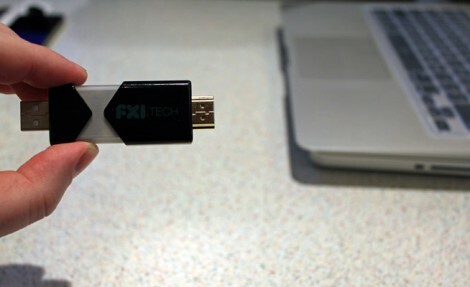 With an HDMI port on one end, and a USB plug on the other for power, just plug in FXI Technologies’ Cotton Candy dongle to create a 1080p Android television. The price isn’t set for the device, but it’s expected to be available at less than $200. Considering what’s inside that’s pretty reasonable. There’s a dual-core 1.2 GHz ARM processor, 1 gig of RAM, 64 gigs of storage, Bluetooth, WiFi, and a microSD card slot. Wow! So is it hackable? Absolutely. Well, kind of? The company doesn’t intend to bring Cotton Candy to the retail market. Instead, they will sell the device to developers who may do what they wish. From there, said developers have the option to license the technology for their own products. This begs the question, will the development kit come in under $200? Hard to say. Hit the web to order up your custom-color cotton candy from this machine (translated). 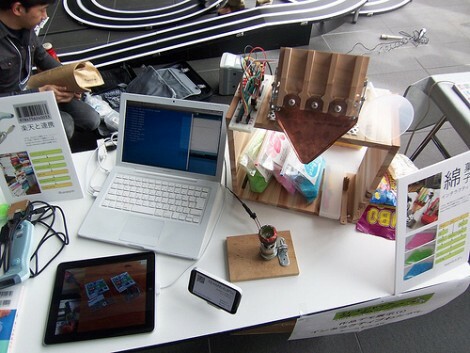 A computer monitors a web interface for an incoming order, then pushes commands to an mbed microcontroller which dispenses three different colors of sugar to whip up your custom shade of the cottony delight. In addition to the sugar dispensing system, the candy maker itself is also a do-it-yourself design. It looks like the most difficult part of this project was getting this component right. They’ve got a collection of videos documenting the multiple attempts on the road to success. Once dispensed, the colored sugars make their way into a spinning metal cylinder where they’re heated by the flame from a butane candle lighter. Eventually the team manages to get cotton candy to form but we can’t help but feel like they’re trying to reinvent the wheel with this one. If you are anything like us, you are suddenly filled with childlike glee when you think of big fluffy poofs of cotton candy. The thought of making it at home has a certain appeal, but that machine is a mystery reserved only for those elite enough to get through cotton candy maker school. Or so we thought. As it turns out, it is actually quite simple. 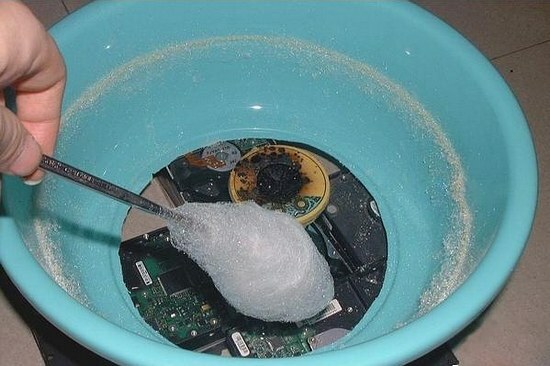 You can make one and be serving cotton candy in an afternoon with parts you probably have sitting around. The video above is pretty easy to follow, but if you want more information, there’s an instructable as well.